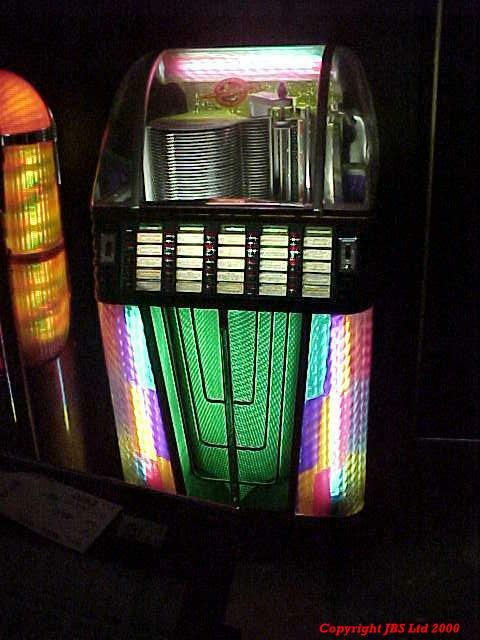 Made in 1956 this jukebox was the last 78 player made by Rock-Ola. It was also strangely the first 45 player as it was made with a modification to play 45s. The modification is not too good so it is recommended that this jukebox is kept on the 78 rpm format. 1434 The Rocket. From 1952, this is a fairly rare machine especially in the condition which this one is in. We have taken a lot of trouble with the original sound system and the results are excellent. This machine plays twenty five 78 rpm records on both sides making it a fascinating mechanism to watch.We have our model in original condition and fully stocked with original tracks of the era, such as Sandman and Rock around the clock.